You can purchase the new 23-page Kids' Wings Unit Tall Tales by Karen Day NOW for immediate download for only $12.95! Includes a recorded song! Click Here to Purchase and Download. We have moved again. This time Dad promises it will be different. He promises HE will be different. No more alcohol. Mom, Teddy, Abby, and I hope he keeps his promise this time. At school, I'm surrounded by strangers, again. Will anyone see me? Will anyone talk to me? Or, will I be invisible again? Maybe, I'll WANT to stay invisible rather than risking someone find out about my family. My dad. I'll just make up tall tales to cover up. Like I usually do...to make people like me. I really do need a real friend, a close friend... someone like Grace Bennett. She smiles and talks to everyone. Snobby popular kids, crippled kids, everyone. I like to write so I go to join the school newspaper staff. Guess who's there? Grace Bennett! And she smiles at me like I'm her friend, too. She's an artist. I'm a writer! When we discover that we even have the same sketch books, things start to click between us. Maybe we WILL become friends! But what if we become CLOSE friends and she wants to come over to my house? What if she sees my dad? I can't let that happen. And what if Dad DOESN'T keep his promise? Will someone get hurt this time? *Tall Tales by Karen Day is the story told through the eyes of a sixth grader. It is the story of the struggle to live with an alcoholic father, the search for a friend, the adjustment to a new school, and the realization that only she can control her own destiny. In the story, you will be able to see roles in the dysfunctional family in action: alcoholic, chief enabler, family hero, and lost child who becomes the scapegoat. Understanding them, you will understand the importance of making the right choices for your own life and seeking help for those things you cannot control. YOU CAN be happy and take care of yourself. Al-Anon: Is your life affected by someone's drinking? 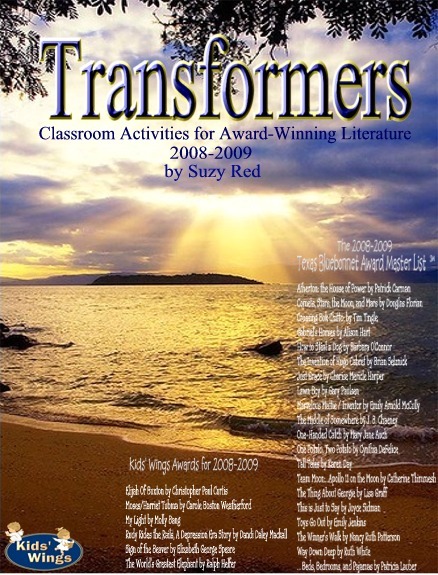 A Unit for Tall Tales by Karen Day is a part of a collection of 24 units in Transformers. the Kids Wings Transformers collection. While you can order individual units for about $12.95, if you order Transformers, you can get all 25 units on sale for only $25 or $1 per unit! You won't find a better deal or better literature guides! * Language Alert: This book contains several instances of a drunken man using God's name in cursing. Although, we at Kids' Wings, choose to honor the name of God in our speech and in our writing, we see the redeeming qualities of this novel as important to many children and families faced with an alcoholic parent. We are grateful to the authors who choose to use finesse in their descriptions of cursing and leave the exact words to the readers' experience and imaginations. Buy Tall Tales by Karen Day NOW!